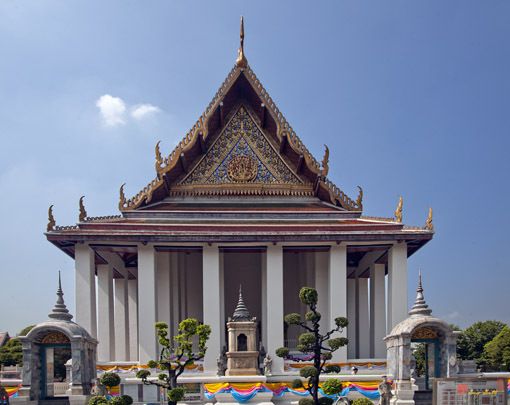 Wat Suthat Thepwararam Ratchaworamahawihan, วัดสุทัศน์เทพวรารามราชวรมหาวิหาร, was founded by King Rama I in the central area of Bangkok. 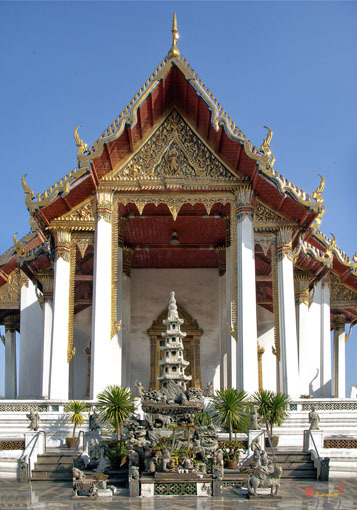 He built the large Wihan similar in style to the Wihan of Wat Phanan Choeng in Ayutthaya. 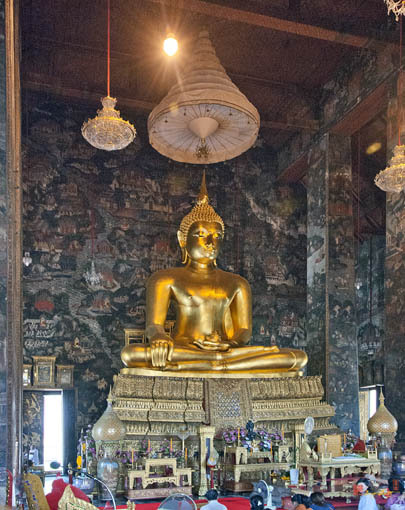 The Sukhothai style bronze Buddha, brought from Wat Mahathat in Sukhothai, was installed inside the Wihan. 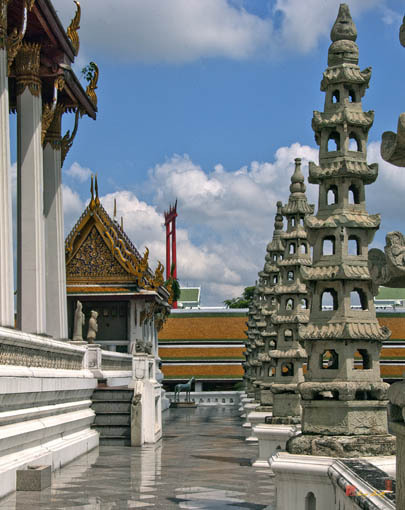 The image was called Phra Toh or Phra Yai which means Big Buddha Image. 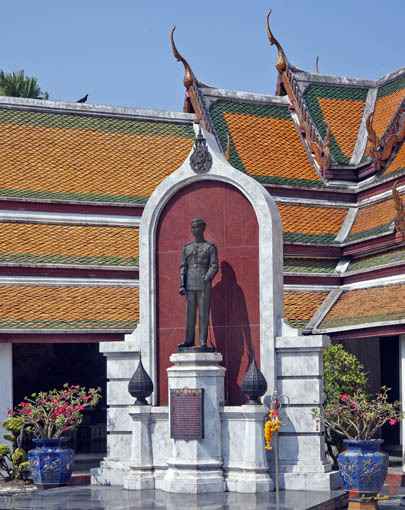 The Wihan (main hall) was completed in the reign of King Rama III. 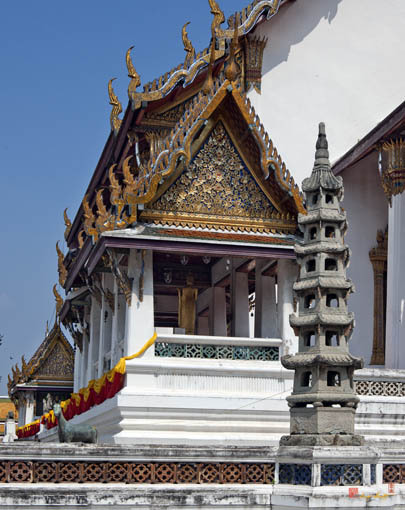 Then the Ubosot (Ordination Hall) was built along with a principal Buddha image for that hall. 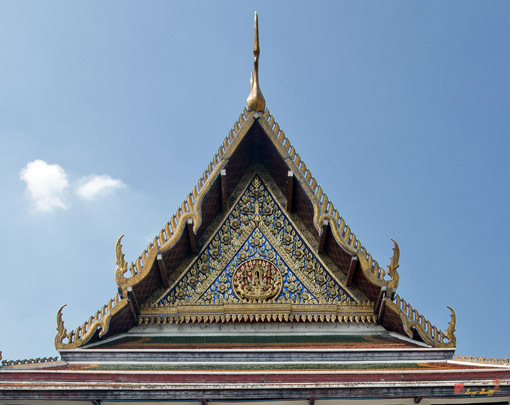 The temple was then named Wat Suthat Thepwararam. 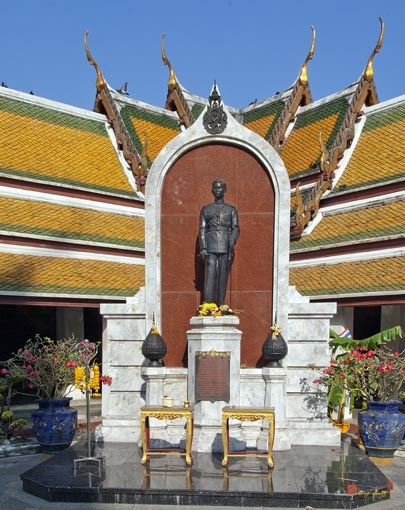 Later King RAma IV named the principal image inside the Wihan Phra Phuttha Srisakkayamuni and the principal image inside the Ubosot Phra Phuttha Trilokachet. 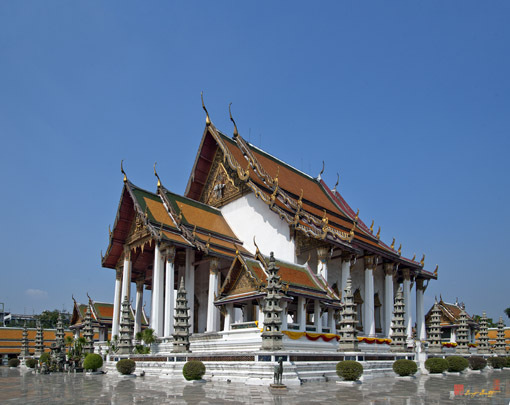 Wat Suthat Thepwararam, วัดสุทัศน์เทพวราราม, is one of six temples of the first grade in Thailand. 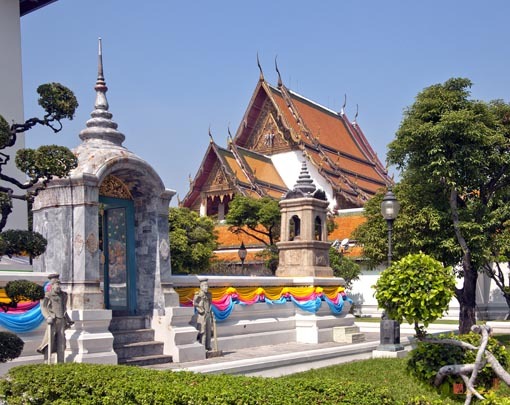 Construction was begun by King Rama I in 1807 (B. E. 2530), to mark the 27 anniversary of the founding of Bangkok, with further construction by King Rama II and was completed in the reign of King Rama III. 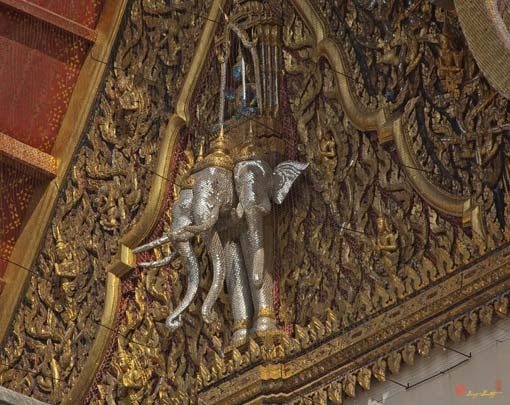 Wat Suthat is famous for the superb murals dating from the reign of King Rama III. 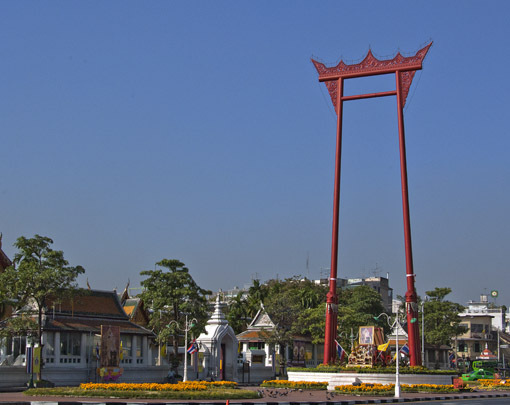 In front of the temple may be seen the giant red swing, Sao Ching Cha, which was used for Brahmanic rituals up through the early 20th century. The principal Wihan is on a three-level platform with small chapels at each corner of the upper level. 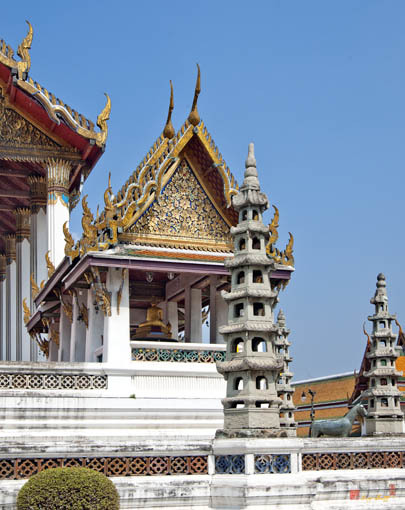 The main Buddha image, Phra Sisakayamuni, is the largest and oldest bronze cast Buddha image in Thailand. 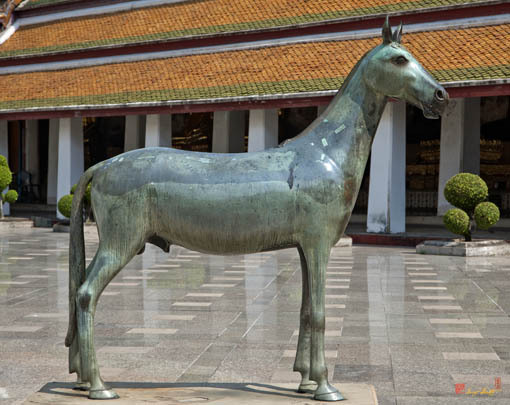 The Ubosot is surrounded by many Chinese statues which arrived in Thailand as ballast used in sailing ships. 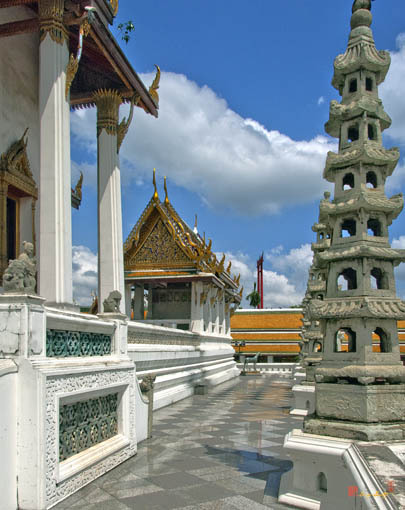 The Wihan is also surrounded by 28 sandstone pagodas on the upper-level wall (representing the 28 Buddhas born on earth) and by beautiful bronze horses at each corner of the lowest level. 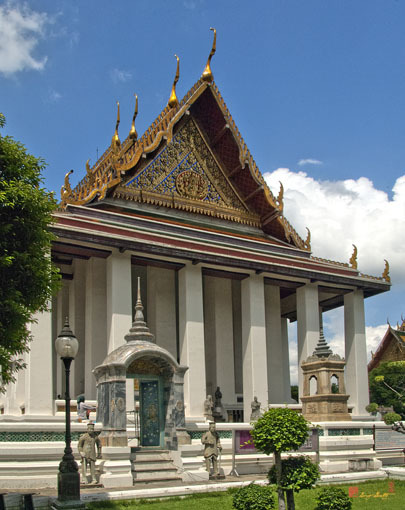 The Ubosot contains Phra Buddha Trilokachet and the Meeting Hall (Sala Kan Parien) holds Phra Buddha Setthamuni.